There are places around the world that tend to be overlooked by most travelers but that nonetheless feature some “thing” special that makes it worth a visit. In the case of the US, there are plenty of spots like this, and when talking about Portland, Oregon, it is not only some “thing” that makes it special – it is many. Portland is a city of about 600,000 that lies in the state of Oregon, in the northwest of the United States. Once a dirty and violent port city, Portland is today a funky metropolis, regarded by many as the mecca of hipsters. Even if you are not a part of this “tribe”, Portland delights all visitors with its rich gastronomy, alternative and more exotic lodging options, and the artisan production of beers and wines. It is said that there are to main motives that made Portland so “cool”: the fact that the city has a more liberal tradition politically and culturally, which causes its inhabitants to be open-minded about what is new and different; and the fact that it was an important center of the American counterculture. This non-conformist movement that developed both in the United Kingdom and the US in the 60s focused on rising against the prevailing norms and values in a society and, at times, had a great impact on the country. (One well-known example in the USA was the so-called hippie movement). Moreover, it was based on this overall “alternative mindset” that Portland also became utterly committed to environmental preservation – which makes it an even more interesting place to visit. The beautiful Rose City (as it is known by many) is one of the most eco-friendly in the world, with electric-powered cars and buildings built with reused materials. In Portland, at least a quarter of the population moves with bicycles, traversing the various cycle paths scattered around the place. 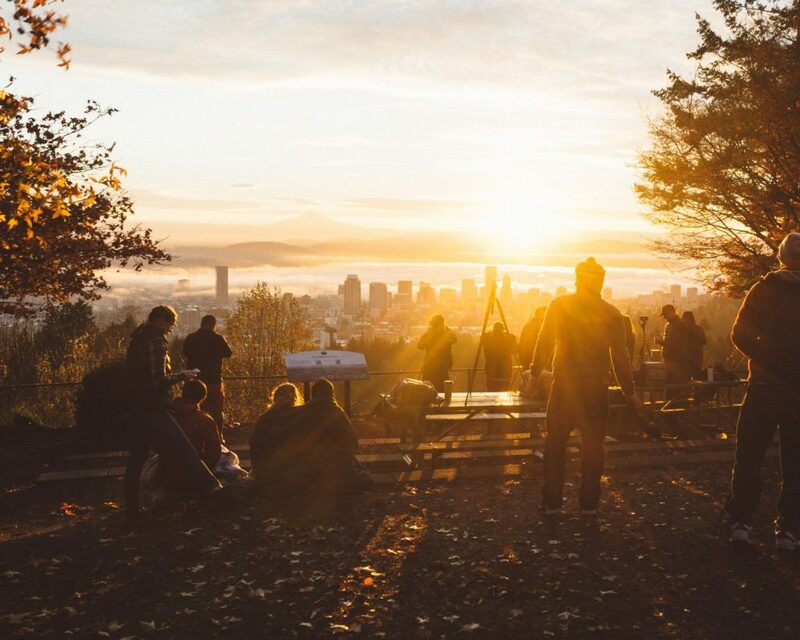 Aside from being a liberal, cultural, and youthful place, Portland has several attractions for travelers, ranging from mountains and natural landscapes, to experimental cuisine and craft beverage production. With receptive and friendly residents, the city is surrounded by nature, with many parks prone to trails. The nightlife is also buzzing, with several bars, craft breweries and distilleries to make the party of travelers – all in an extraordinarily quiet and safe environment. In short, in Portland, you will find a receptive atmosphere, open-minded people, and with incredible food and drinks. Portland is considered one of the great world capitals of beer and there are several festivals in honor of the drink. So, do not be surprised if you find yourself going to the cinema to taste a particular beer, after all, the great law of the residents is: “Keep Portland Weird!”Another curiosity is that the climate of Portland is very conducive to planting roses, which gave the city the nickname “rose city”. Portland is situated in the far northwest of the United States. The nearest large, well-known city is Seattle, the capital of Washington state, which borders Canada. Just above Seattle is Vancouver, Canada, so if you want to do a combined tour, you can link a road trip from/to Vancouver, Seattle and Portland. A quick glimpse at the map will show you that, apart from these two cities everything else is kind of out of the way of Portland. Nevertheless, there are constant flights connecting Oregon’s largest city with all other major cities in the US. Regardless of how long you wish to stay in Portland, there will always be something to see. But in order to fit other destinations in your itinerary, a week is ideal to visit most attractions. As for the best place to stay, the region around SW Washington Street – which is close to Downtown and Chinatown – is a good bet since it provides is easy access to anywhere around the city. When considering what to do and see in Portland, the best option is to walk around as much as possible or rent a bicycle to make the exploration more effective and fun. The Portland Japanese Garden is considered one of the most beautiful in the world outside Asia, with a tea house used for demonstrations and special occasions. There are five distinct environments within the park’s 12 acres, including azalea bushes, sand, waterfalls and short trails within easy reach. The beautiful Lan Su Chinese Garden is another great treat for visitors, perfect for relaxing on a sunny afternoon. The St. Johns Bridge is another place of easy access and offers a beautiful panoramic view of the city – ideal for couples and families. If you have time during your stay, take a trip to the Multnomah Falls, located in Troutdale, just a 30-minute drive from Portland. If you are into art, it is also worth to check out the Portland Art Museum, with a collection of important artists such as Monet and Degas. As for the perfect end-of-day attraction, you can visit the Old Town – a bohemian neighborhood that aside from featuring many cool bars also houses the gigantic Portland Saturday Market, which is the largest art and craft fair in the United States. Finally, if you happen to be in Portland during summertime, enjoy the Brewer’s Festival, which takes place at Tom McCall Waterfront Park in July.